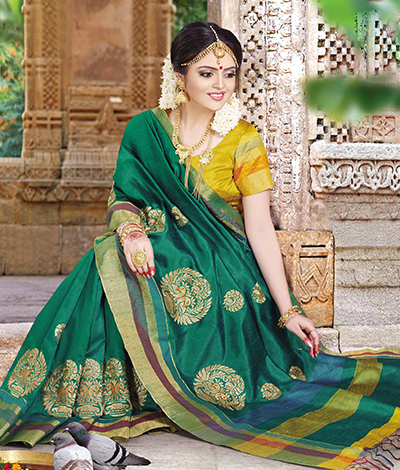 When you think of buying sarees from South India, you are seriously spoilt for choice. The five southern states – Andhra Pradesh, Telangana, Karnataka, Tamil Nadu and Kerala – have a rich history of producing some of the most interesting saree weaves and yarn blends. Oldest history from the states in this region shows that there has always been an interesting tradition of weaving and handlooms in this part of India. Since saree was and continues to be the main attire among women here, weaving this 6 yards has evolved into an art and a flourishing industry – that’s extremely popular, not just in India, but also globally. 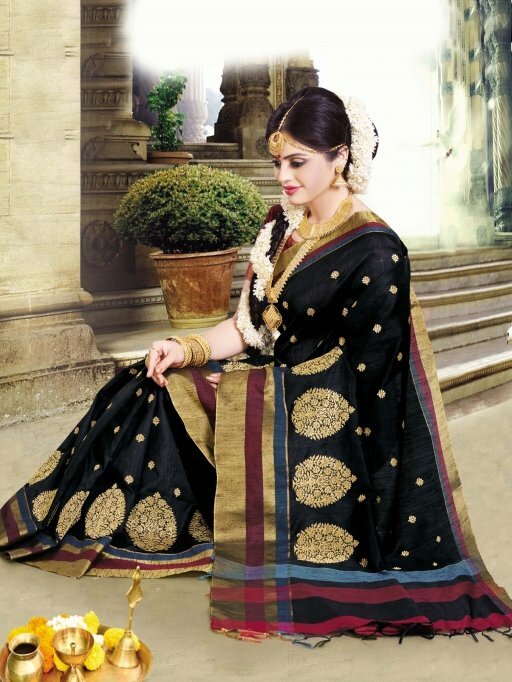 South Indian Sarees have crossed these humongous levels of popularity and adoration from not just the fact that Southern India has the maximum saree consumers. Well, that’s just one side of this. Another key reason is the fact that these sarees and weaves – despite continually increased innovation and technological intervention – have managed to retain their characteristic qualities, charm – and uniqueness. These sarees are made from the finest raw material, yarns and fabrics – a reason that many of these heirloom quality drapes. From richest and most precious of the silks to breeziest cottons, new-age, eco-friendly fibres like java cotton, banana silk and bamboo silk – to innovative blended fabrics (to suit all needs and budgets) – the South Indian Sarees industry covers it all! What makes the sarees from South India stand out are characteristic patterns and designs that never seem to lose their charm, use of great raw materials and amazing craftsmanship that has stood its ground since centuries. Despite being so all-encompassing, when it comes to textile arts and traditions, the South Indian textiles and weaving industry is extremely resourceful and innovative. With almost every region boasting of its unique weaves, saris and patterns, the South Indian saree industry is truly an amazing one. When you think sarees from Tamil Nadu, many of you will invariably think Kanjeevaram. And why not? These heavy, ornate, brightly coloured silk sarees are a wardrobe staple – often reserved for most special occasions and bridal trousseaus - for anyone who loves sarees. Kanjeevaram saree is produced from mulberry silk thread, in its purest form, and while the threads are produced in South India, the heavy zari used in the sarees hails from Gujarat. The body, border and pallu colours are always in contrast – the designs are also very different. One interesting fact about Kanjeevaram sarees is that pallu, border and the body of the saree is woven in a separate manner and then joined using a sewing technique. The designs and motifs in this type of saree are inspired by nature and old temples in South India, as well as the epics - Ramayana and Mahabharata. 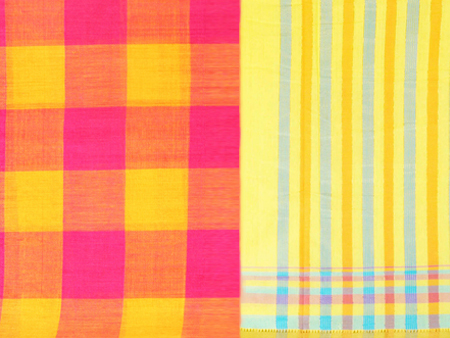 One of the most popular cotton sarees is from popular Mangalgiri town in Guntur district. 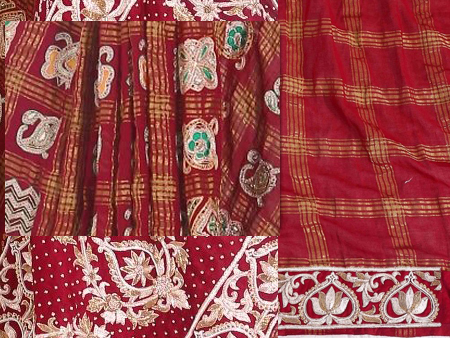 The sarees often have bright, rich colours and a very smooth, earthy feel to the fabric. 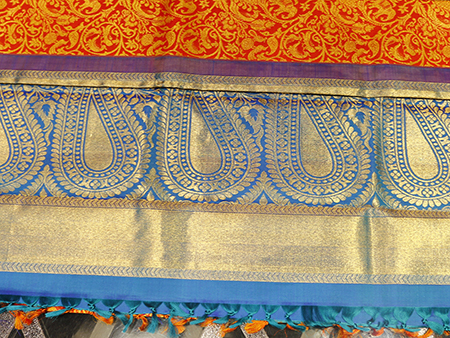 Mangalgiri cotton sarees mostly have single coloured bodies with dense zari or gold thread border. In fact, the sarees have evolved from the tribal wear of the region, and till date, the pallu and the border have a densely woven geometric pattern. The cotton is smooth to the touch and gives a beautiful drape. Traditionally, Manglagiri cotton sarees come solid colours or maybe with very fine and minute cheques. In the modern rendition of Mangalgiri cotton sarees, you will find shot tone sarees that gives new depth and dimension with movement under the light. It is a good idea to pick up this kind because the Mangalgiri fabric is pretty strong and the colours remain bright even after many washes. Think of finely done ikat and Pochampally is the place that comes to mind. This region, in Andhra Pradesh, is a cluster of small towns with master weavers who use special tie-dye technique to produce beautiful ikat patterned sarees. The ikat sarees from here have bold and very geometric designs in bright and vibrant colours. Whites, blues, black, sunset yellow, oranges are popular hues. In terms of design diamond in the square is very prevalent in Pochampally Ikat. The feel of the fabric is smoother and lighter than other ikat fabrics across India. The uniqueness of Gadwal sarees stem from the fact that each saree has cotton, silk and zari woven innovatively. 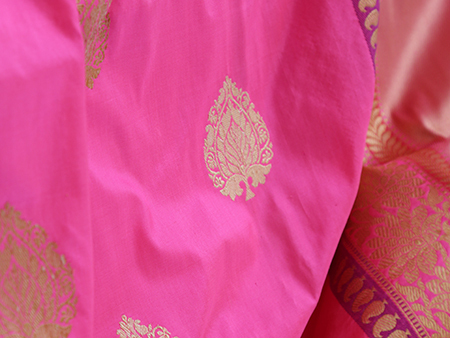 A true Gadwal saree has a soft cotton body, silk border and pallu decorated with zari designs. This saree has an amazing drape, and if you like to own traditional attire, then a Gadwal in natural earthy tone is a wardrobe must-have. In its modern rendition, Gadwal saree body is sometimes made with a blend of silk and cotton yarns to give it a sheen and softness. Definition of fine cotton saree that is soft, sturdy and drapes well is a Guntur saree. Made from finest of Andhra cotton, this saree has evolved from the tribal fabric of the region. The cotton is very resilient and can be worn daily. Despite that, the sarees are often soft to touch and drape beautifully over the body. The colours are very bright – oranges, greens, maroons and deep blues. The sarees have checks and stripes with narrow borders with simple or gold thread work and minimalist pallus. Because of the ease and comfort of wearing this saree, many dancers often use Guntur sarees as a dance attire, especially when they are practising. This is why Guntur saree is also called Dance saree. Kasavu: When you think of fabric from Kerala, the first thing that comes to the mind are crisp, off-white sarees with beautiful, bright gold border. We are talking about the Kasavu saree or Kerala saree. The beauty of the Kasavu saree is in its simplicity and minimalistic look – soft woven cotton with medium border and pallu. Traditionally, Kasavu saree have been woven in cotton with gold thread weaving on the border and the pallu. 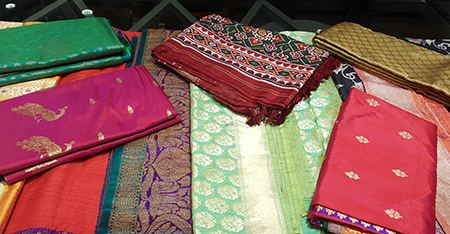 But with the popularity of silks for festive wear, Kasavu sarees are now woven in silk as well and while regular Kasavu sarees have a plain off-white body with thin to medium sized gold zari border and pallu; the ones woven for festive wear have a thicker border, with floral motif woven in the pallu. 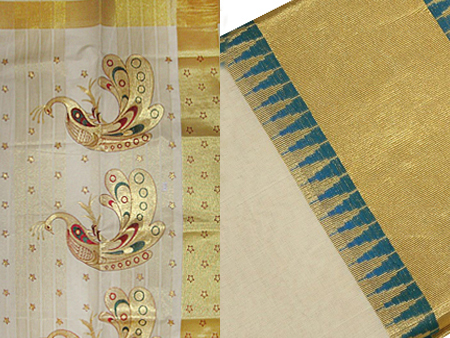 Some festive sarees also have gold buti design made around the saree pleats. In the modern rendition of the Kasavu saree, the weavers have started weaving shot tone borders and pallus where the gold thread is shot with solid coloured thread to give the borders a new dimension. Colours like green, maroon, deep blue are a popular choice for the same. Molakalmuru: The Molakalmuru saree has emerged from a small town near Chitradurga in Karnataka. The sarees often woven in silk and cotton are rich with motifs and are heavy on design. If you are one for temple design, then pick Molakalmuru saree, as temple motifs in the saree and temple borders are the main highlight. There are many variants of this saree. You will find sarees with multicoloured checks in the body with contrasting pallu; double border with two threads in contrasting colour; silk brocade with intricate zari work; and narrow bordered Molakamuru saree with narrow border showcasing flowers, birds, fruits, and chakra motifs. 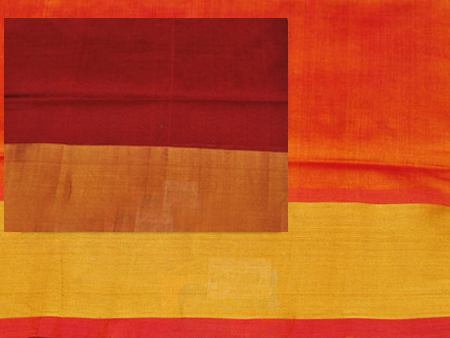 IlKal: Ilkal sarees are based on ancient weaving technique that had developed in the Bellary region of Karnataka. Known to be 9 yards when it comes to length, the Ilkal sarees have beautiful embroidery called kasuti. In fact, this intricate saree weaving technique where the pallu and the body are woven using a complex setting was a dying art; till it was revived recently. The Ilkal saree is available in pure cotton, silk and cotton blend and pure silk. The designs on the saree often depict temple towers, and bold geometrical motifs inspired from mountains and grain fields. A traditional Ilkal saree generally comes in three colours including red, peacock blue and parrot green. 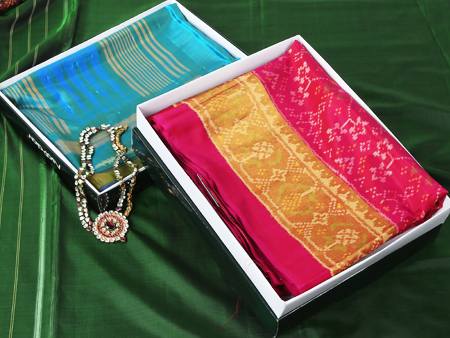 Uppada: Uppada sarees are mostly available in silk and use the age-old Jamdani weaving style. These sarees are lightweight and diaphanous with a sensuous drape. The weaving style has evolved from the earlier flailing weaving technique, used by the weavers in Bangladesh. 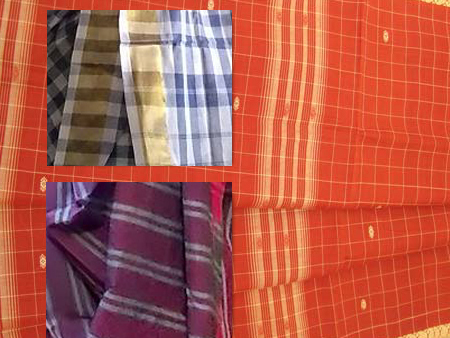 In fact, Jamdani silk saree weaving was dying till recently, before it was revived by major textile designers – the technique replanted in the Uppada town, and hence the name. 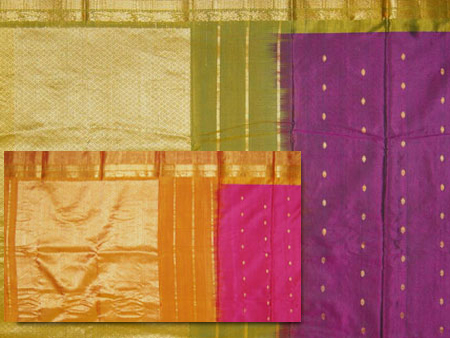 Gorgeous Uppada weaves are mostly made in bright colours and soft pastels – accentuated with gold zari work, woven intricately into the fabric. Two weavers are needed to make one saree, and the floral patterns inspired from old Mughal and Persian designs are what make Uppada sarees stand out. You will actually be spoilt for choice, when it comes to the vast range of cotton and silk sarees that are produced in different towns, across all the southern states in India. Characterized by beautiful checks, bright colours combinations and interesting, intricately woven pallus and borders, these lovely drapes hold their forte, even among latest and contemporary ensembles. Whichever the southern state or region may be, it has its own special saree variant. Many of these are day-wear and regular-wear sarees, which are very sturdy and are made from thick yarns – to cater to the local populace as well as women from all over India – who wear sarees every day. But, many like Kanjeevaram and Uppadda are glorious examples of splendid traditional weaves – that are a must-have for every bride or anyone, planning to attend a wedding. 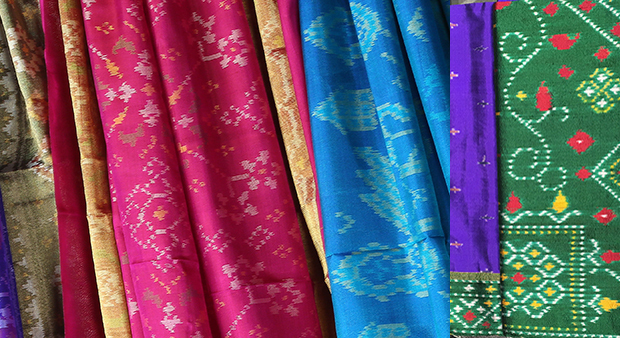 The South Indian cotton sarees are known to be very strong, durable and weather-proof, because of the tight weaving technique the weavers use. 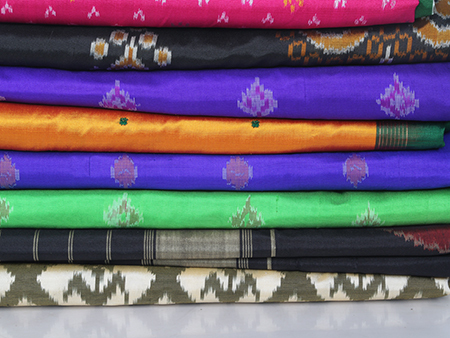 Prized for their resilience, many of these sarees, like Venkatigiri cotton and cotton-silk (sico), are used as bases for fabric techniques like bandhani, gharchola and even many block printing styles. Moreover, if you like saris that drape easily, and add vibrancy to your wardrobe with eye-popping hues, then sarees from South India are an ultimate choice.